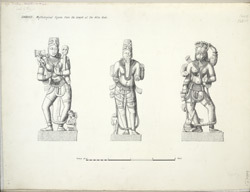 Illustration of mythological figures from the Kalika Mata temple near the Hira gate in Dabhoi from James Burgess' 'The Antiquities of the town of Dabhoi in Gujarat.' Dahboi, located 20 miles south-east of Baroda, is an ancient town with fortified walls which was built in the early 13th century by the Vaghela king of Patan. Key features of fortress include four 13th century gateways called the Baroda gate, Nandod gate, Hira gate, and the Moti Gate. The temple of Kalika Mata built c.1225, can be found in the north-east section of Dabhoi, bordered by the Mori gate on the north and the Hira gate on the south. The Kalika Mata temple is known for the carved friezes depicting animals and floral patterns.